Kyzylorda (Kazakh: Қызылорда, translit. Qyzylorda, قىزىلوردا), formerly known as Kzyl-Orda (Russian: Кзыл-Орда), Ak-Mechet (Ак-Мечеть), Perovsk (Перовск), and Fort-Perovsky (Форт-Перовский), is a city in south-central Kazakhstan, capital of Kyzylorda Region and former capital of the Kazak ASSR from 1925 to 1929. The city has a population of 157,400 (1999 Census). It historically developed around the Syr Darya River and the site of a Kokand fortress. Population: 188,682 (2009 Census results); 157,364 (1999 Census results). Seljuk, the founder of the Seljuk dynasty, got his start near here. The city had its beginnings in 1817 as the site of a Kokand fortress known as Ak-Mechet, or white mosque. The later-famous Yaqub Beg was once the fort's commander, but he was apparently not in command during the final battle. In 1853, during the Russian conquest of Turkestan, the fort was taken by Russian troops under General Vasily Perovsky. The Russians established a new fort and called it Fort-Perovsky (Форт-Перо́вский), after the general. The town of Perovsk (Перо́вск) in Russian Turkestan later developed around the fort. In 1925, the city was renamed Kzyl-Orda (Кзыл-Орда) and was designated as the capital of the Kazak ASSR. The name literally means a red city, from the Turkic "кзыл" (red; used here in the common Soviet ideological connotation) and the Turkic Mongolian "орда" (city). In 1929 the capital was relocated to the southeastern region and Almaty. "Kyzylorda", the Kazakh-based romanized spelling, has been used since the late 20th century after the dissolution of the Soviet Union and Kazakhstan's independence in 1991. Kyzylorda has a cold desert climate (Köppen climate classification BWk) with hot summers and cold winters. Precipitation is low throughout the year, particularly in the summer months. Snow is common, though light, in winter. The lowest temperature on record is −33.9 °C (−29.0 °F), recorded in February 1969, and the highest temperature is 46.0 °C (114.8 °F), recorded in July 1975. Kyzylorda is known for its rice production. Many hundreds of hectares are devoted to rice production. Two rice mills operate in the city. There are 285 comprehensive schools in the region, where 150,472 students are taught. In addition there are 17 secondary professional schools and 13 professional technical schools. There are 11 higher educational institutions, among them one state institute, 5 branches associated with it, and 5 independent High Education Institutes. In the region there are 67 children's preschool establishments, where 4476 children are taught. Kyzylorda State University (KSU) after Korkyt ata is the leading center of education, a science and culture center in the Aral region of the Republic Kazakhstan. Established in 1950, the university trains highly skilled specialists in 54 specialties, at 11 faculties, 48 chairs, on 20 specialties of a bachelor of degree and 7 specialties of magistracy (master's degree). 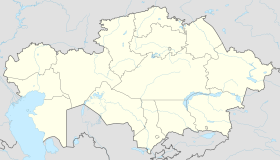 Kyzylorda has one airport. It has developed as the supply center of the important oilfields in the nearby Turgay Basin. For regular employment of the population of region by physical training and sport there are 7 stadiums, 6 sports complexes, 1 swimming pool, 1 track and field athletics arena, 1 hippodrome, 113 shooting galleries,4 tennis courts, 687 sports-ground, 136 playgrounds, 15 sports nucleus, 1 bowling center, 168 adapted gymnasiums (gyms). In May 2005 Ilya Ilin won the world championship among youthful sportsmen in Pusan (S.Korea), Rusjianovsky Roman became the bronze prize-winner. A victory of 17-year-old sportsman of heavy athletics, Ilya Ilin in the world championship in Qatar was the triumph of the year. He improved a personal record, established two records of the world among youthful sportsmen. In December cyclists finished the participation of regional sportsmen in the international competitions. In December, 15-18, 2005 they took part in the championship of Asia on a bicycle track. Berik Kupeshov(recently rider of the Astana Cycling Team) and Kilibayev Alexander became champions of the Asian contingent. Within one year players of handball club "Seihun-KАМ" were success; they won the first place in the republic championship. In 2006 the republic won a championship in the Greco-Roman wrestling in weight categories of 55 and 74 kg (121 and 163 lb). Kuketov Ermek and Zhusipov Dastan won a gold, medal and Bakhyt Sagaev became a bronze prize-winner. The city participated in the open Kazakh Cup in bandy 2009. Points of interest for tourists in the Kyzylorda region include the vanished Aral Sea and the Baikonur cosmodrome, archaeological excavations in Sauran and Shyganak, the memorial complex of Korkyt Ata, and several ancient mausoleums. Asim Thahit Abdullah Al Khalaqi (1968-2015), Yemeni formerly held in Guantanamo, given asylum by Kazakhstan in 2015. ^ a b "Население Республики Казахстан" (in Russian). Департамент социальной и демографической статистики. Retrieved December 8, 2013. ^ Valikhanof et al, The Russians in Central Asia, 1865, page 315, says " according to Kirgiz accounts, about the year 1817." Kirgiz meant Kazakh at that time. ^ a b "Weather and Climate - Kyzylorda" (in Russian). Weather and Climate (Погода и климат). Archived from the original on November 25, 2016. Retrieved November 25, 2016. ^ "Kyzylorda travel guide | Caravanistan". Caravanistan. Retrieved June 22, 2018. ^ "Kardeş Şehirler". Bursa Büyükşehir Belediyesi Basın Koordinasyon Merkez. Tüm Hakları Saklıdır. Retrieved July 27, 2013. Wikimedia Commons has media related to Kyzylorda. This page was last edited on 8 April 2019, at 20:51 (UTC).